History of Chess—Know Your Game Better! Chess is a board game of strategic skill for two players. This game requires a certain degree of intellect to master due to its complex rules. The history of chess is dated back almost 1500 years and was first originated in Northern India, but it is still a popular board game today. Chess is also known as the “Game of Kings”. When this game was introduced, the rulers and emperors saw this game as the perfect practice for dealing with other monarchs and challengers. They also saw this game as the perfect way to hone their strategies then implement them during war time. Many people have the common misconception that chess is a difficult game that will take years to truly understand and master, but that is not true. People from all age groups can learn the rules that govern this exceptional board game. After learning the rules, all it takes is a few games to get the hang off and slowly every player starts developing the skills to master this game. People enjoy playing chess not only due to its cognition stimulating properties but also due to the fact that it is fun! These advantages shed light on the fact that playing chess will not only help kill time but can actually be very beneficial for regular players. This is exactly why it is imperative that every individual is familiar with the rules of this complex board game. These rules might seem difficult at first but a few games will help clear the confusion behind them. The goal of the game is to capture the other player’s king – this is known as checkmate. Checkmate can only be achieved if the other player’s king is in such a position that there is no escape. Once the pieces are equally divided and each player is sitting at opposite ends, the game of chess can commence after the pieces are kept in their proper positions. The first row will start from the left, Rook, Knight , Bishop, king ,Queen Bishop, Knight, and Rook. The second row will have the remaining eight pawns in each square. Once the pieces are in their appropriate position the next step is to determine who makes the first move, traditionally a coin can be flipped or any other capricious method such as guessing the color of the hidden pawn in a player’s hand. Once it has been established which player will make the first move, the game of chess has now begun and there is no turning back. 1)King: The most important and weakest piece each player has is the king. Once the king has been captured, the game is over. The king in essence can only move one square in any direction, this means forwards, backwards, left, right and diagonally. Beginners should try to start the game by strategically protecting the king, then start pouncing on the other player’s pieces once they are out in the open. 2)Queen: There is no doubt that the queen is the most powerful piece on the board. The queen can move in any direction as long as she does not have to move through any of her teammates. For example, if the queen is right in the middle of the board she can move to each corner of the board unless her fellow pieces are in the way. Never make the mistake of bringing the queen out in the open too early, although she is very powerful and can cause mayhem, she should be protected. 3)The Bishop: Just like the queen, the bishop can move as far as possible but only diagonally. Since a bishop can move only diagonally, it will always remain in the same box color and just like the queen it cannot move through team mate pieces. Bishops generally work very well together as they complement each other’s weaknesses and strength. Also, make sure that your bishops are not trapped and use them to their true potential. 4)The Rook: The rook can also move as far as it wants but only forward, right, left and backwards. Just like any other piece, it cannot move through a fellow team mate piece. They are particularly powerful pieces that can be used to both defend and attack. Using rooks efficiently can be a game changer, make sure your rooks are never trapped in a corner but are out in the open. 5)Knights: These crucial pieces move very differently compared to other pieces, this is due to the fact that a knight can jump over or move through chess pieces, this allows them to move freely around the board. They can move two squares in one direction and move at a 90-degree angle mimicking the shape of the letter L. Knights are very valuable in eliminating the other player’s pawns and other pieces; they should always be out in the open preferably in the middle of the board. 6)Pawns: Never make the mistake of underestimating the potential of a pawn, these pieces can be used to completely control the game. Initially a pawn can be moved two squares forward, after that they are limited to moving only one square. Pawns can capture other pieces only diagonally and cannot move backwards. If another piece is blocking a pawn’s path, that piece will be stuck unless the obstructing piece is moved out of the way. Also, if a pawn manages to move all the way to the other end of the board, it can be replaced by any piece besides the king. So, if a player manages to steer his or her pawn to the other end of the board they can replace it with a queen and dominate the game. Another talent of the pawn is its ability to capture another piece when moving forwards two squares, if it lands next to the opposing player’s pawn deflecting its chance to capture then that pawn can be captured. If a player cannot do any of the above steps, then game over, the opposing player has successfully conquered the game. .When a player does not have a legal move left and the king is not in a checkmate position. .When both players simply do not have enough pieces left to threaten the other player. .A draw can be declared if exact positioning of pieces has been repeated three times. .When fifty moves have been made but no pieces are captured. .When both players get fed up and call it a draw. So these scenarios can end in a stalemate or draw, this means neither player has lost or won. .Touch rule: If a player touches a piece then he or she cannot change their mind and move another piece. If a player wants to adjust the position of any piece on the board then he or she has to say ‘adjust’ out loud. .Timers: On a professional platform chess is played with a timer, each player is allotted the same amount of time which they can use according to their strategy. If a player runs out of time then they will lose unless the other player does not have enough pieces to produce a checkmate. 2)Closed chess game: This strategy is the complete opposite of an open chess game strategy. In this case, the pawns have a defined structure to reduce the mobility of other pieces. 3)Good bishops: This strategy involves using bishops to its true potential by moving pieces in such a way that the bishop is free to capture the opposing player’s pieces. This means spreading other pieces like the pawns and knights in such a manner that they do not construct the path of their bishop. 4)Decoy: This involves sacrificing pieces in order to bring the opposing player’s piece in a vulnerable position. Decoys are mostly used to bring the opposing player’s king or queen out in the open. These decoys are in most cases pawns, these pawns can be strategically placed around the board to bring out the opposing player crucial pieces like the queen or the bishop. 5)Windmill: This is probably one of the most lethal strategies that a player can incorporate in his or her game. This involves capturing the opposing player pieces in such a way that they cannot retaliate. So a player will only capture another piece if they are sure that they can safeguard their pieces. Although windmill is a very effective strategy, it will take some time to instill in a player’s game as there is a certain level of difficulty in gauging the position of a piece after it captures another. 6)X-ray: Another effective strategy is the X-ray. This involves carefully analyzing each piece and the direction they are heading in. 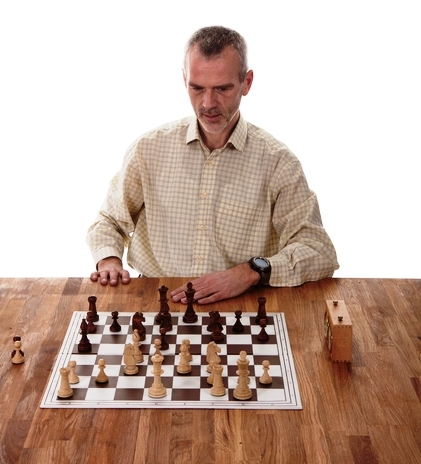 If a player keeps an eye on the direction of his or her pieces they can control the outcome of the game and can also make strategy changes according to the direction and pace of the game. 7)Deflection: This strategy involves targeting the opposing player’s pieces that are defending important pieces like the queen or the kings. A player will have to sacrifice a few pieces in order to get the defending piece out of the way, but it should be done in a subtle manner. 8)Outpost: This strategy will take a little time and experience to fully understand and apply. This involves positioning a piece in such a place that the opposing player will only be able to capture it after sacrificing a few pieces. This will also limit the amount of freedom the other player has in maneuvering his or her pieces. 9)Checkmate patterns: Most people do not even realize that during the course of the game, many unintentional opportunities arise which players do not capitalize on. In normal games, a player first focuses on bringing the other player pieces out and then slowly articulate a way to capture the king, this strategy on the other hand involves targeting the king from the start. 10)Sacrifice: Most players in the beginning make the common mistake of capitalizing on every opportunity they get to capture the opposing player’s pieces. This is a not a very effective strategy as the goal of the game is not to eliminate the other player’s pieces but is rather to capture the king. This strategy involves letting some opportunities slide so that the player does not give up his position or crucial pieces. Finally, for all the beginners out there, who are new to the world of chess, play a few games and try incorporating the strategies above to equip you with the skills necessary to become a chess master. Keep in mind losing a few games might actually teach you much more than winning. We been playing chess for over 20 years, and chessboss.com is where we like to share, and give chess tips and advice.